“Wrestling is fake.” That’s what my great grandmother told me when she found me watching WWF Superstars when I was eight. What she meant, of course, was that wrestling was scripted—these weren’t real fights or contests; the winners were predetermined. On that, she was certainly right: regardless of his skill as a grappler, poor Barry Horowitz had as much chance of pinning the Ultimate Warrior as I did. And, frankly, this knowledge only made the show more interesting. Once I knew I was watching a scripted story, I began to appreciate exactly how those tales were told. Wrestling stories have their own rhythms and beats, and picking up on the repetitions and variations on those themes was brilliant fun for my young brain. But there was a question that never once popped into my head as kid, oddly enough: if all this stuff was written, who was writing it? It’s a complicated question, without an easy answer. I’ve never seen a wrestling program with a “Written by…” credit, and the sport’s shady, carny roots have always prevented that kind of transparency. In addition, the live theater aspect gives everything something of an improvisational flair. It’s tough to say with any certainty how much of what came to the screen was made up on the fly and how much was preplanned. (I say this from experience: I spent a few months as a writer for a local wrestling organization in southern Texas about a decade ago. The scripts we wrote and the events that actually occurred often bore only a passing resemblance to each other.) 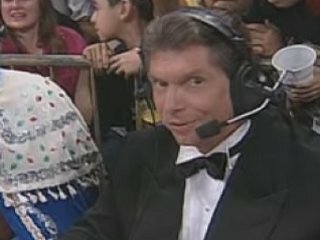 But while it may be difficult to give credit to specific writers for particular moments or episodes, when it comes to the World Wrestling Federation, the majority of it can go to owner Vince McMahon, the closest thing the WWF has ever had to a showrunner. His guiding hand in the 1980s and early ’90s is so identifiable, in fact, that when his attention was pulled away a few years later, the resulting programs resonate as some of the strangest ever aired. To hear McMahon tell the story, he single-handedly took professional wrestling out of smoky bars and bingo halls and into the mainstream in the 1980s. The accuracy of those claims is debatable, but there is no question that the WWF rose to prominence while pushing forward a product remarkably different from its competitors. Eschewing the more “sport”-like elements, the WWF became loud and cartoonish in the ’80s, with over-the-top villains and larger-than-life heroes. The centerpiece of McMahon’s company was Hulk Hogan, who exemplified everything a WWF superstar was supposed to be. He was loud, he was boisterous, and he was huge. Hogan appeared to stepped directly out of a four-color comic book—an aesthetic only helped by his original moniker, “the Incredible Hulk Hogan”—and took the center stage in McMahon’s simple morality plays. For more than a decade, Hogan presided over the WWF as “Hulkamania” captured the fanbase. Instead of the bloody bruisers that were more typical of pro wrestling in the past, McMahon used Hogan to appeal directly to the little kids: Hogan was, of course, a hero, but the talking points of Hulkamania boiled down to little more than “Say your prayers and eat your vitamins.” Failure to abide by these simple edicts was usually punishable by a big yellow boot to the face, followed by the dreaded Big Leg Drop. (Hogan’s ridiculous and unrealistic offensive strategy was a result of him not being actually that talented as a wrestler in the first place; this didn’t matter much, considering his opponents, as we’ll see.) Other wrestling heroes had been defined by their skill in the ring, but McMahon turned Hogan into a superstar with loud music, bright lights, and flag-waving. 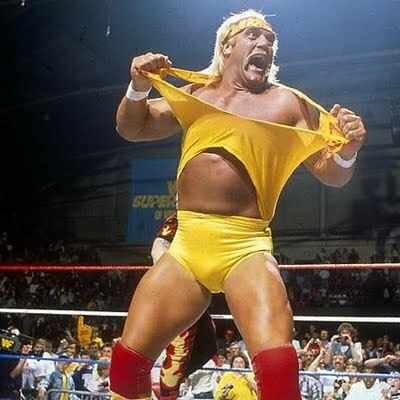 The building blocks for a basic Hulk Hogan storyline were painfully simple, and one would have thought that the fans would have started to tire of them after the fifth or sixth cycle. (As one of those fans, I can tell you that most of us did not.) First, McMahon would choose a bad guy, a process that occurred more or less at random it seemed. The villain, as Mr. Glass would teach us in Unbreakable, would be the opposite of the hero in every way. Where Hogan was virtuous, the villain was scheming and deceitful. Where Hogan played by the rules, the villain would be a nasty cheater. Where Hogan was a “real American,” the villain would probably be a foreigner. And where Hogan was a mass of muscle and bulk, the villain would be fat. Big, fat, and gross. And that was pretty much all McMahon needed: find a big, fat heel, have him sucker-punch Hogan, and boom, there’s eight months’ worth of television programming. The list of Big Fat Heels who met their end at the boot of Hulkamania is long, and littered with some wrestling legends. I could pick just about any example, but the one that resonated with me the most as a kid would have to be Earthquake. The late John “Earthquake” Tenta met each and every criterion on the Big Fat Heel checklist: he was fat (billed at over 400 pounds), he was scheming (the usual wrestling clichés of eye-gouging and the like), and he was even foreign (Tenta hailed from Canada, though I don’t recall them ever making much hay from this). Even better, Earthquake used his terrifying mass as a weapon—his finishing move, the “Earthquake splash,” featured him literally sitting on his opponent. Mad Libs story outline filled, McMahon sent Earthquake after Hulk Hogan on the May 26, 1990 episode of Superstars. Lured out to do an interview with red-faced comic relief villain “Brother Love,” the Hulkster spends a few moments threatening manager Jimmy Hart before the Earthquake sneaks up from behind (naturally) and hits Hogan with the obligatory steel chair (of course). Then, while Hart babbles incoherently into a microphone, Earthquake drops onto Hogan for three of his Earthquake splashes, until Hogan is unconscious and trembling in pain. The bad guys disappear and paramedics, WWF suits, and referees arrive to cart Hogan away on a stretcher. As ridiculous and obvious as this segment is, it’s remarkably well-constructed. Wisely, McMahon chooses not to include any announcer commentary over the footage, so nothing can distract from Earthquake’s vicious attack. Early in the sequence, the camera cuts to a stunned mother in the stands, hand over her heart, too shocked even to comfort her ashen-faced son. It became an instant classic moment of WWF television, one that still sticks with those who saw it in their youth. (I can clearly remember watching this episode a month shy of my ninth birthday, sitting in my great-grandmother’s living room—in the same chair where I was sitting when she told me it was all fake—and thinking that this had to be real, because how could Earthquake sit on someone like that and not hurt them?) The rivalry that sprang up took WWF television shows through the rest of the year, as Hogan went through his usual plot of recovery, comeback, and triumph. And then it was off to the next Big Fat Heel, as the outbreak of the Gulf War in early 1991 gave Hogan more obese foreigners to fight. It’s a simple formula. So simple, in fact, that it’s difficult to imagine anyone screwing it up. But real life made its presence felt a few years later, and it showed that maybe you needed more than just a musclehead hero and a Big Fat Heel. It turned out that Hulk Hogan was using more than just prayer and vitamins to build his physique—there was ample evidence that he, and most of the other WWF performers, were deep into steroid use. Even worse, the federal government believed that Vince McMahon himself was involved in their distribution. In 1993, as the feds built their case against the WWF, McMahon became convinced he would soon be prosecuted. With more important things on his plate than writing a new Big Fat Heel storyline, he stepped away from direct control over the episode-to-episode product, and things started to… slip. By most accounts, the “book” (wrestling carny parlance for the writing duties) was given to Pat Patterson, a longtime McMahon associate who could be trusted to keep things together in the boss’s absence. But poor Pat ran into a few speed bumps. First, Hogan was gone. With the feds looming over the steroid question and Hollywood beckoning, the Hulkster bowed out of the WWF in June 1993, taking his big yellow boots with him. This left the company in something of a quandary, because their entire storytelling style had been, for a solid decade, built around their jingoistic superhero. They tried to create another real American superstar for the kids to rally around: suddenly, Lex Luger—who had been billed most recently as “The Narcissist”—started wearing red, white, and blue tights and waving flags around. But it didn’t really work. Second, the pool of Big Fat Heels had all but dried up, most of them having either retired or already been squashed by Hogan. They had one left: Yokozuna, an evil sumo wrestler, who was granted the spot as the number one villain seemingly on account of his girth. The fans certainly hated him, but without a decent hero, ratings sagged. Desperate for a new challenger, Patterson settled on one of the other superstars left behind in the wake of the steroids scandal, a lumbering brawler called The Undertaker. Launched in 1990 as an experiment in creating more “out-there” characters, The Undertaker was a masterpiece of wrestling method acting. His character was originally portrayed as something approaching a zombie, impervious to pain and practically unbeatable. Though he entered the WWF as a villain, his intriguing character—and Mark Calloway’s perfect, uncanny performance—turned him into a fan favorite very quickly. And with nothing else left to go on, in late 1993, The Undertaker was chosen as the next challenger to Yokozuna’s WWF title. But of course, The Undertaker couldn’t actually win: the WWF needed to keep the championship on Yokozuna until WrestleMania X a few months later, WrestleMania being the traditional good-guys-win show on the WWF calendar. And, it turned out, The Undertaker was nursing a badly injured back, and would need to be taken off of television for several months. Patterson needed Yokozuna to win, because he needed to stay champion, but he couldn’t have The Undertaker lose, because it would irreparably hurt the character’s image. This is a fairly common dilemma for wrestling bookers, and there are any number of creative ways around it. The method Patterson chose… well, it had the virtue of having never been tried. Yeah, this is where things get weird. When Fuji seizes the urn, he opens it, and, for reasons never explained, smoke begins to pour from it. As the smoke billows out, The Undertaker begins to weaken, and, finally, the bad guys get him inside the box and close the lid, ending the match. Yokozuna is triumphant, and he and his gang start wheeling the casket to the backstage area (to bury it?). But they don’t quite make it down the aisle before The Undertaker’s music begins playing on the speakers, and smoke—”The same stuff that was coming out of the urn!” note the announcers—sprays from under the lid. As the bad guys look around in terror, the arena is plunged into darkness, save for a spotlight on the casket itself. The video screen above the entrance walkway lights up, and we’re greeting with an image of The Undertaker, apparently inside the casket, where he delivers an utterly bizarre, unhinged speech that sounds like something from a late episode of Twin Peaks. Soliloquy delivered, The Undertaker’s face is replaced with a negative image, which then begins to “rise” from the screen. As it does, a shadow is seen rising through the smoke—a shadow clearly much smaller than The Undertaker. And then, he disappears, the lights come on, and Paul Bearer, somewhat anticlimactically, wheels the casket out of the arena. Patterson’s approach to booking a main event storyline was unique, certainly. But it was, perhaps, a little too ambitious—wrestling’s tenuous grasp with reality can only stretch so far, and The Undertaker was quite a stretch already. Having your superstar rise to the heavens after promising a glorious rebirth is, perhaps, slightly too much for the medium to bear. Vince McMahon certainly thought so. He hadn’t disappeared from the company during his legal troubles—in fact, he can be heard as one of the announcers on that very match—but after a jury acquitted him on all charges later in the year, he once again took control and returned to the old ways of a muscular, cool hero and a Big Fat Heel. Of course, time would show that that McMahon’s method had run out of gas, and his dependence on formula would practically bankrupt the WWF a few years later. Vince eventually saved his company by radically rewriting the style and stories the WWF brought to the screen. So perhaps Patterson’s experiment of thinking outside the box (casket?) can be looked at not as a mistake, but as an important reminder that it’s always worth it for storytellers to take chances and risks… even if their stories involve zombie morticians and evil sumo wrestlers. J. Walker is an amateur audio engineer in Houston, TX, where he co-hosts the Television Podcastulacra podcast. You can follow him on Twitter @evilgenius815.